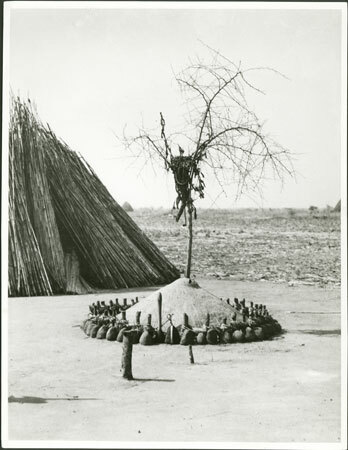 A shrine (riek) consisting of a mound of earth surrounded by offerings of tobacco with a sapling of the nyuot tree planted in the centre, set up after the death of an individual due to lightning strike. Such individuals are considered to become colwic, spirits of the above that were once people, taken directly by God. This specific intervention by the divine is considered so dangerous to all associated with the deceased that sacrifice is made by all concerned, and such a shrine erected with offerings and sacrifice. This image was taken among the Eastern Jikany Nuer by F. D. Corfield, District Comissioner at Nasir on the Sobat River in Upper Nile Province during Evans-Pritchard's fieldwork. Morton, Chris. "Nuer colwic shrine" Southern Sudan Project (in development). 03 Jan. 2006. Pitt Rivers Museum. <http://southernsudan.prm.ox.ac.uk/details/1998.346.365/>.